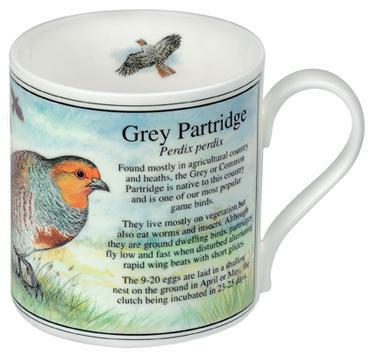 Grey Partridge Bone China Mug. Found mostly in agricultural country and heaths, the Grey or Common Partridge (Perdix perdix) is native to this country (Great Britain) and is one of our most popular game birds. They live mostly on vegetation, but also eat worms and insects. Although they are ground dwelling birds, Partridges fly low and fast when disturbed alternating rapid wing beats with short glides. The 9-20 eggs are laid in a shallow nest on the ground in April or May, the clutch being incubated in 23-25 days.